Rev’d Dr. Maria says that Mother Alcena Boozer, a former Rector and current member who also grew up in Portland, was the first female African American priest in Oregon. She has paved the way for women and African Americans. Rev’d Dr. Maria was raised in the Russian Orthodox Church. However, Eastern Orthodox churches do not ordain women. The Episcopal has given her the opportunity to do what she loves – to serve as a priest. Even though women have been recently ordained, there are still barriers and sexism that exist in Christianity. Rev’d Dr. Maria believes that God is everywhere, in all things, and we are all called to work alongside God. She likes working with others to figure out what God does in one’s life, and then nourishing that work. She loves to help people recognize their gifts, hone in on them and share them with everyone. She loves her job, and believes all human beings have gifts which can bless others. As a new priest in the neighborhood, Rev’d Dr. Maria’s goal is to listen to what the parish and the neighborhood needs and to figure out what is important for everyone. 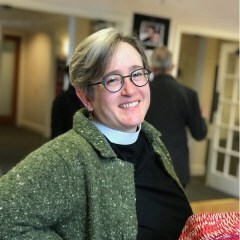 Being a white woman herself, Rev’d Dr. Maria has expressed that she is very concerned that the neighborhood is becoming whiter and whiter, and that the parish and neighborhood has changed primarily due to gentrification. She does not want to lose the African American parish, and says that the church used to draw folks who lived in the neighborhood, but families dedicated to the parish for generations and the members who live further out now, still come to the church. She hopes that even if the parish is no longer primarily African American, it continues to be diverse and welcoming. On Saturdays, St Philip the Deacon Episcopal Church provides free hot meals and groceries to about 150-300 people in the community. It has been doing this for over 20 Years. The parish is dependent upon the Oregon Food Bank, and is working with their tiering system to get better and more stable selections of food. Volunteers run and participate in this event, and anyone can come and volunteer. Everyone is welcome to come and eat (I grabbed myself a bag of groceries and chowed down on some chicken tortellini with salad, and it was delicious!). St. Philips the Deacon Episcopal Church also allows homeless people needing a safe place to sleep on the porch. There are rules on how to use and share the space. Rev’d Dr. Maria mentioned her desire and ideas for building appropriate shelter and accommodations to mitigate homelessness (with an immediate need for a porta potty for those utilizing the space at the church, right now). Prior to interviewing Rev’d Dr. Maria, I visited the parish’s services on Sunday. Upon entering the church, I experienced and observed a very warm, welcoming, inclusive, and diverse environment. The members are very friendly and seem to connect well with each other and their guests in a peaceful and loving manner. Members went out of their way to introduce themselves. Rev’d Dr. Maria is the ‘Real Deal’. Her sincerity and passion for people, especially about those who are less fortunate, only scratches the surface of who she is and the work that does, and is destined to do. She is extremely energetic, enthusiastic and she highly encourages the children’s participation, as young as 3 and 4 years of age. The children seem to love to be up front, says one member, partaking in the services. One small child in particular, kept shouting Amen! It seems the spirit of the lord was moving through his little soul, as well. I do not practice this faith, but I enjoyed the service, and I plan to visit again, on just the vibe alone. Rev’d Dr. Maria definitely practices what she preaches! So, if you are up for a positive shift of energy on any given Sunday, consider coming on down to St. Philip the Deacon Episcopal Church and checking out the new priest in town!